One Aldwych dates back to 1907, designed by The Ritz's architects as home to The Morning Post newspaper, and reopened in 1998 as a grand and thoroughly modern hotel. Grand, historic yet modern stealth wealth hotel near Covent Garden. The grand, historic Grade II listed One Aldwych building dates back to 1907, designed by The Ritz's architects as home to The Morning Post newspaper, and reopened in 1998 as a grand and thoroughly modern hotel. Designed by Jestico Whiles with Mary Fox Linton creating the award-winning interior, there are TVs in the bathrooms, bespoke Bowers & Wilkins iPod docking stations, a Screening Room seating 30, and Wi Fi throughout. But it's not just about the high tech spec and stealth wealth design. One Aldwych also benefits from being in a great location - right in the middle of the West End, a few minutes walk from Covent Garden. It's also exceptionally well equipped, with 105 gorgeous modern rooms, a stylish and well equipped fitness centre, private screening room and two restaurants. Health club facilities include a 150 square metre gym, open to hotel guests 24 hours a day, a chlorine-free 18-metre swimming pool next to several treatment, sauna and steam rooms. An outstandingly well run and welcoming hotel, One Aldwych lives up to its stylish decor and enviable location. 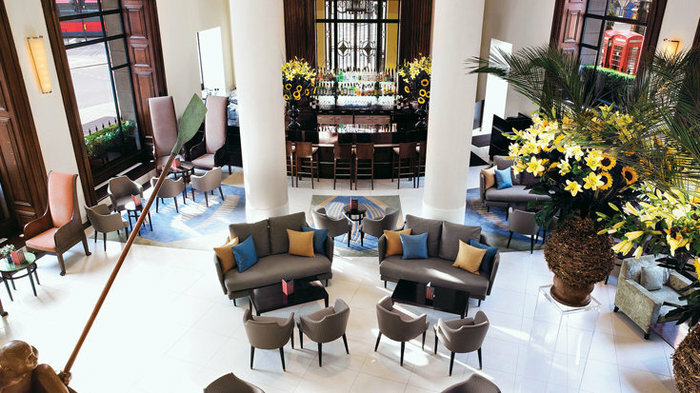 "Probably the most beautiful hotel lobby bar in London" - Evening Standard. Named one of the top five hotel bars in the world by the Sunday Telegraph, The Lobby Bar at the chic One Aldwych hotel is renowned for its fresh and inventive cocktails in a superb, airy location. Contemporary sculptures, vast flower arrangements, bespoke furniture, dark oak panelling and a polished limestone floor all combine to make the Lobby Bar a stylish yet unpretentious haven from the hustle and bustle of the West End. Smartly dressed, polite and extremely talented bar staff mix together 63 original cocktails and 22 martinis - some of the best in the capital. Bar snacks include sushi, duck spring rolls, organic gravadlax and mini wagyu steak burgers - while every drinks order comes with a trademark bowl of hot assorted nuts (work the trip alone). The Lobby Bar can get quite busy depending on the schedule of the many nearby theatres and so you may not always get a table - but with double-height ceilings and loads of floor space, you can easily stand in or around the bar without being shunted around the place. Described as "probably the most beautiful hotel lobby bar in London" by the Evening Standard, the Lobby Bar is a firm favourite of discerning drinkers off The Strand. With such a chic and relaxing atmosphere it's the perfect place to start an evening. Axis on the lower ground floor of One Aldwych has its own separate street entrance. A striking restaurant within easy reach of Covent Garden, Axis on the lower ground floor of One Aldwych is ideal for modern British food in a grand, five star hotel setting. Overseen by executive chef Dominic Teague, who begun his career as an apprentice at the Lanesborough Hotel before working at Marco Pierre White's L'Escargot then leading the kitchen at the Sandy Lane Hotel in Barbados, the restaurant's menu includes dishes like Atlantic cod with braised puy lentils, ravioli of barrel-aged feta, and honey-glazed Domme duck made, where possible, with foraged foods such as sea purslane and wood sorrel. Artisanal cheeses from La Fromagerie are served with plum chutney and walnut and raisin bread, and there's a wide selection of vegetarian and gluten-free dishes. On weekends the brunch menu is perfect for a leisurely weekend treat, offering smoked salmon and scrambled eggs on toasted brioche, beetroot risotto, and a dessert buffet with choices of bitter chocolate tart, poached pears, and apple and rhubarb crumble. One of two dining options at One Aldywch, Axis on the lower ground floor has its own separate street entrance while Indigo, on the mezzanine level, overlooks the spectacular light-filled lobby. Above the buzzing Lobby Bar downstairs, Indigo is a relaxed, informal restaurant. On the mezzanine level above the buzzing Lobby Bar, Indigo Restaurant is one of two restaurants within the fabulous five star One Aldwych. A relaxed, informal restaurant with wonderful panoramic views of London, the menu is Modern European. Typical dishes on the frequently changing menu include Thai beef salad, whole grilled plaice, and beef bourguignon served with creamy mashed potatoes. Leave room for dessert and finish with sweet sticky toffee pudding with clotted cream, or custard tart with roasted figs and honey ice cream. Open every day for breakfast, lunch and dinner, the central London location - a short from more than a dozen celebrated theatres as well as the world famous Royal Opera House - makes it a top choice for a pre or post theatre dinner. It's also casual enough to encourage Sunday brunch followed by a leisurely reading of the Sunday papers. A state-of-the-art gym, 18-metre swimming pool and three treatment rooms. The large basement fitness facility at One Aldwych, open to hotel guests 24 hours a day, has a variety of aerobic equipment, free weights and machines, and plenty of room for yoga. At 150 square metres, the state-of-the-art gym is a large dedicated space, and has dedicated personal trainers on hand. The Health Club isn't just for gym fanatics, it's the perfect place to chill out with a stunning 18 metre chlorine free swimming pool, complete with underwater music, mood lighting and a projector. Three treatment rooms offer indulgent spa treatment from prestigious Spanish skincare brand Natura Bissé, and there are sauna and steam rooms as well as a comfortable relaxation space with newspapers, magazines and fresh fruit to help you stay healthy. Private Screening Room seating 30. Film and Fizz is a weekend wonderful treat where you can enjoy a delicious three course meal and a screening in the luxurious screening room which seats just 30 poeple. Sink back into luxurious leather armchairs, watch a fabulous film, sip a chilled glass of Champagne (Lallier bubbly, no less), and relax over a delectable meal, all for less than £50. The screening room also hosts Live at One experiences where guests can enjoy ballet and opera from the nearby Royal Opera House (live via satellite), together with a dinner in Axis and a glass of Champagne. From cheap budget accommodation to luxury 5 star suites see our deals for hotels, including Grange White Hall Hotel London from 57% off.